To give you some idea of how we managed to pack so much into just a few days! 16:30 – 17:30 Cultural experience: Visit to Nakamura Residence: 18th-century farmer’s house designated as a national heritage site http://www.japan-guide.com/e/e7108.htm . Check in at Akabana House. 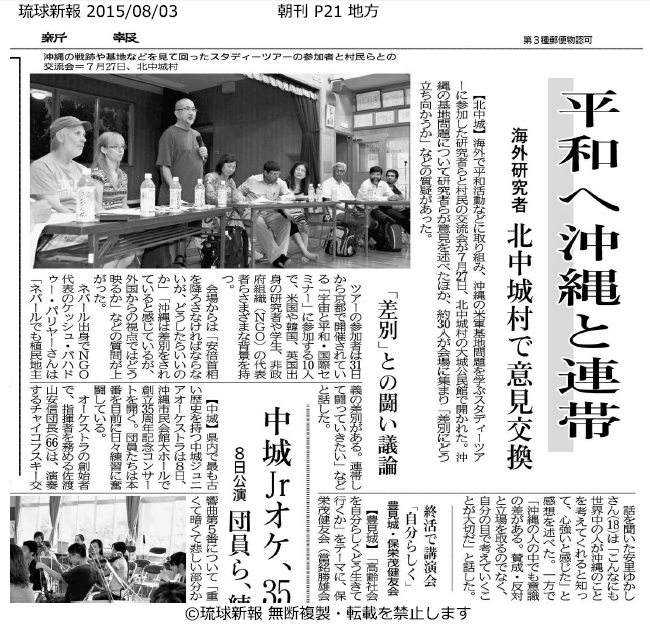 Evening Panel and social gathering with local citizens at Kitanakagusuku Community Centre. 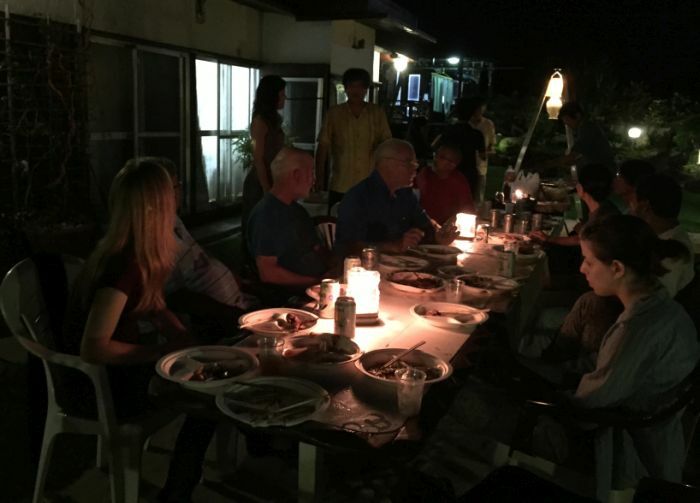 19:00 Barbeque Dinner at Teruya with local activist as guests. 15:40 Arrive KIX and travel to Kyoto (for GN Conference). 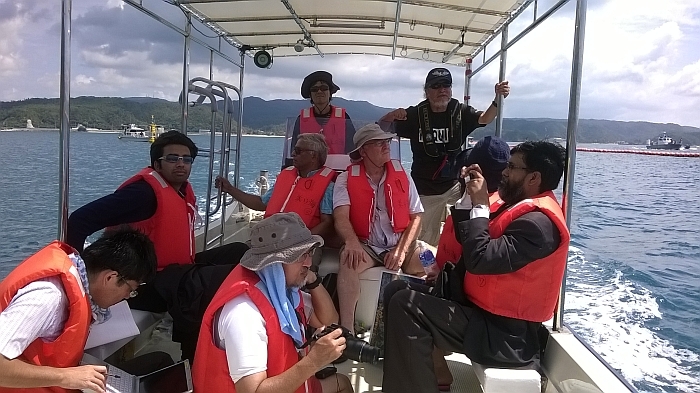 Thanks to Sakota and Yasuyuki for their excellent management of the whole expedition. 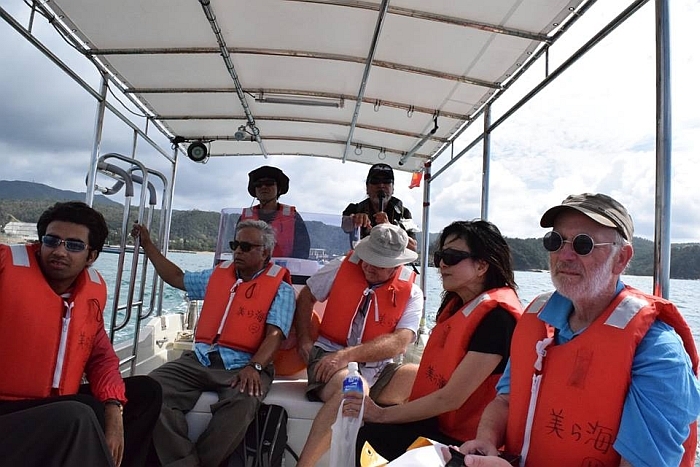 Okinawa is also known as the "Keystone of the Pacific" - Taipei, Shanghai, Hong Kong, Seoul, Manila, and Tokyo all lay within a 1,500 kilometer radius of the islands. 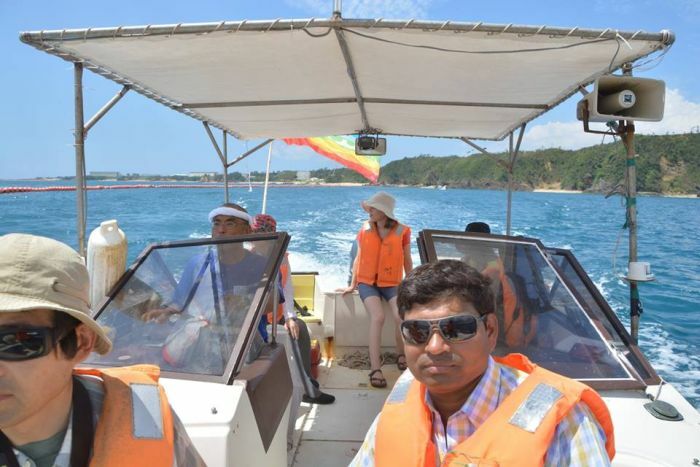 Okinawa is equidistant from several parts of the Pacific, whether it's Tokyo, Seoul, Taiwan or the Philippines. 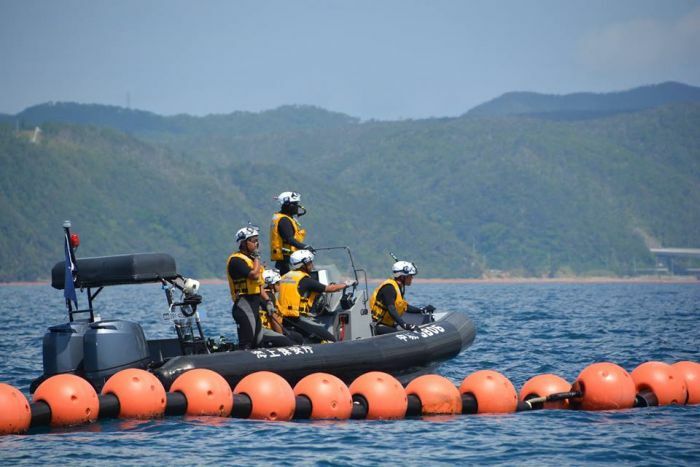 If there is a trouble spot in the Pacific and the Department of Defense needs to move forces quickly, Okinawa had the facilities to support that response. 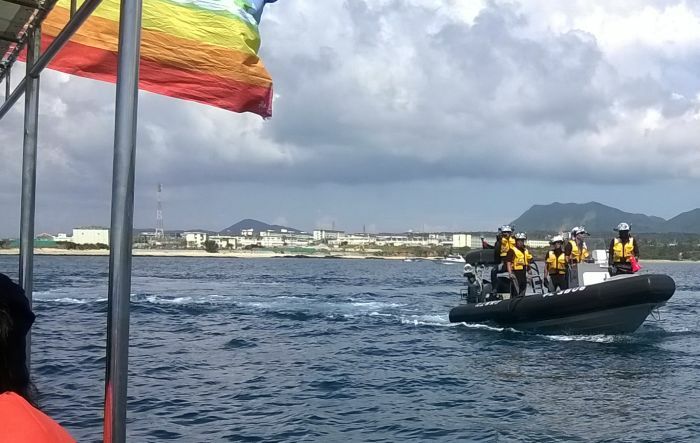 "In late March 1945, a fierce battle such as has rarely been seen in history took place on these islands. The "Typhoon of Steel" that lasted for ninety days disfigured mountains, destroyed much of the cultural legacy, and claimed the precious lives of upward of 200,000 people. The Battle of Okinawa was the only ground fighting fought on Japanese soil and was also the largest-scale campaign of the Asia-Pacific War. 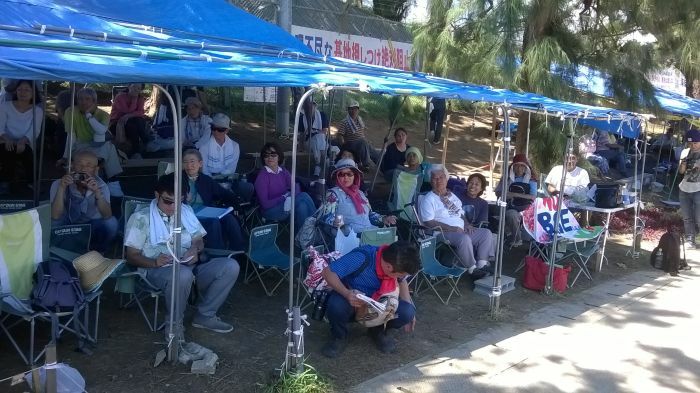 Even countless Okinawan civilians were fully mobilized. 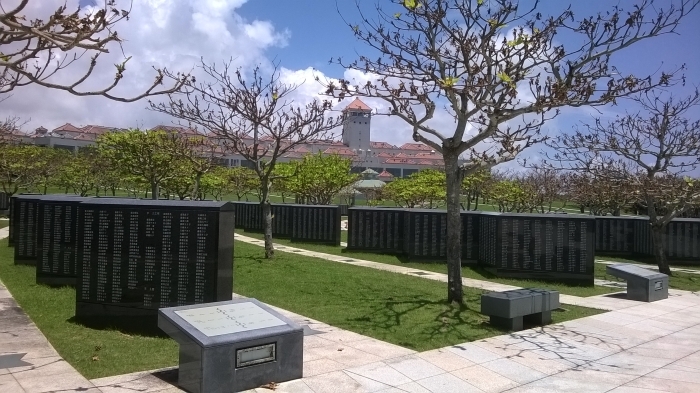 A significant aspect of the Battle of Okinawa was the great loss of civilian life. At more than 100,000 civilian losses far outnumbered the military death toll. Some were blown apart by shells, some finding themselves in a hopeless situation were driven to suicide, some died of starvation, some succumbed to malaria, while other fell victim to the retreating Japanese troops. 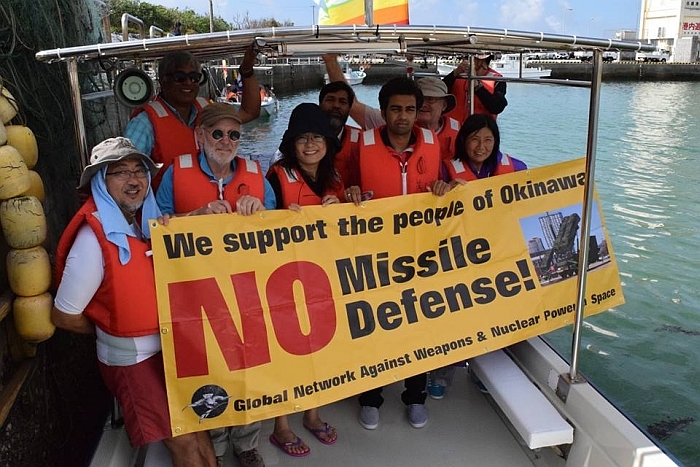 Under the most desperate and unimaginable circumstances, Okinawans directly experienced the absurdity of war and atrocities it inevitably brings about. 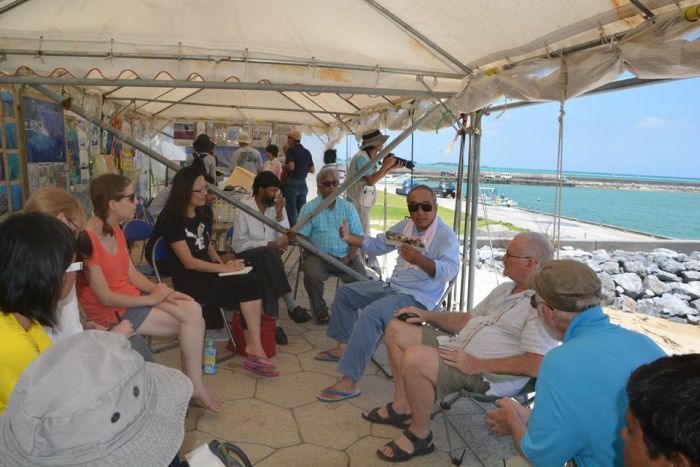 This war experience is at the very core of what is popularly called the "Okinawan Heart," a resilient yet strong attitude to life that Okinawan people developed as they struggled against the pressures of many years of U. S. military control. 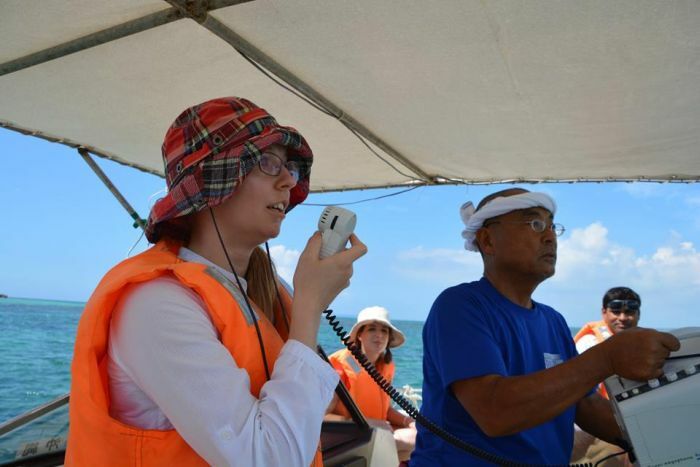 The "Okinawan Heart" is a human response that respects personal dignity above all else, rejects any acts related to war, and truly cherishes culture, which is a supreme expression of humanity. 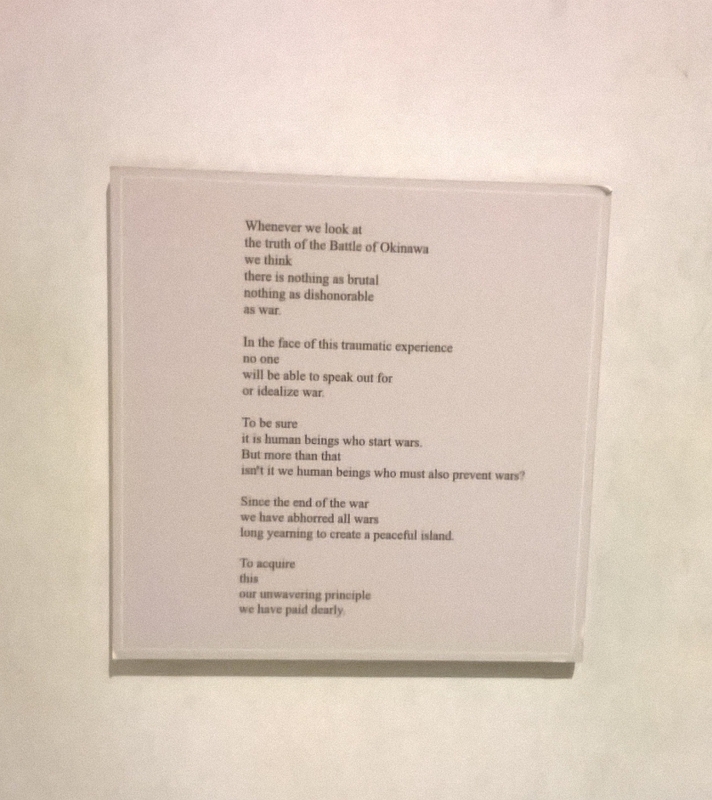 In order that we may mourn for those who perished during the war, pass on to future generations the historic lessons of the Battle of Okinawa, convey our message to the peoples of the world and thereby established, displaying the whole range of the individual war experiences of the people in this prefecture, the Okinawa Prefectural Peace Memorial Museum. 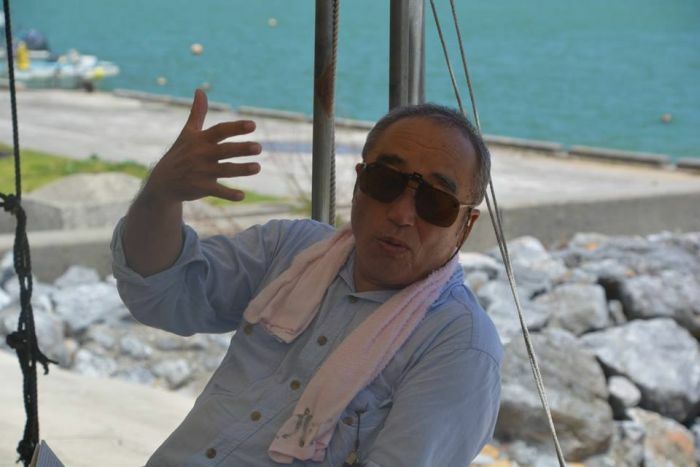 1975 (partially revised April 1, 2000) Okinawa Prefecture"
Professor Masaie Ishihara explains the concept of the "cornerstone of peace", which situates Okinawa as a place of connection between different peoples. It flips on its head the military slogan: "keystone of the Pacific". "Whenever we look at the truth about the Battle of Okinawa, we think there is nothing as brutal, nothing more dishonorable than war. In face of this traumatic experience, no one will be able to speak out for or idealize war. To be sure it’s human being who start wars, but more than that, isn’t it it we human beings who must also prevent wars? Since the end of the war we have abhorred all wars long yearning to create a peaceful island. To acquire this our unwavering principle we have paid dearly." This US communique from 1949, just prior to the end of the U.S. occupation of mainland Japan, reveals that Emperor Hirohito encouraged the U.S. to continue to militarily occupy Okinawa. Okinawa was an independent nation known as the Kingdom of the Ryukyu Islands but was conquered in 1609 and occupied by the Japanese clan Satsuma. However, they remained the Kingdom of the Ryukyu Islands until the Government of Japan was formed. 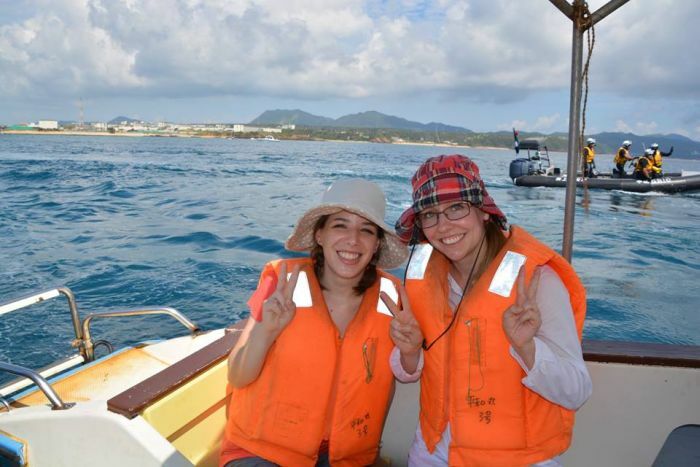 In 1879 the islands were officially recognized as the Japanese prefecture, Okinawa. 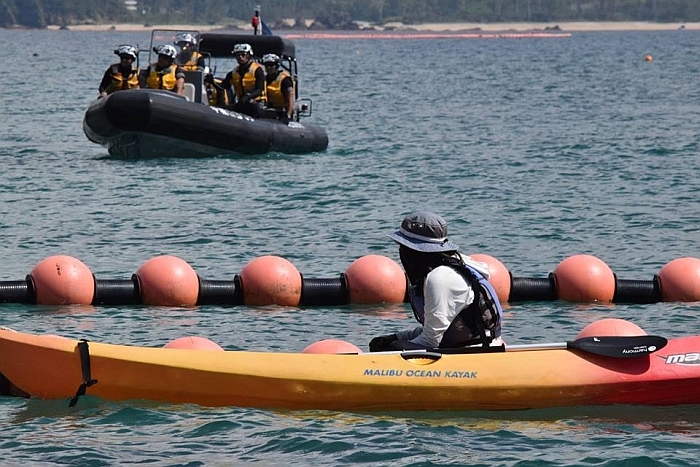 The US military presence in Okinawa began at the end of World War II. 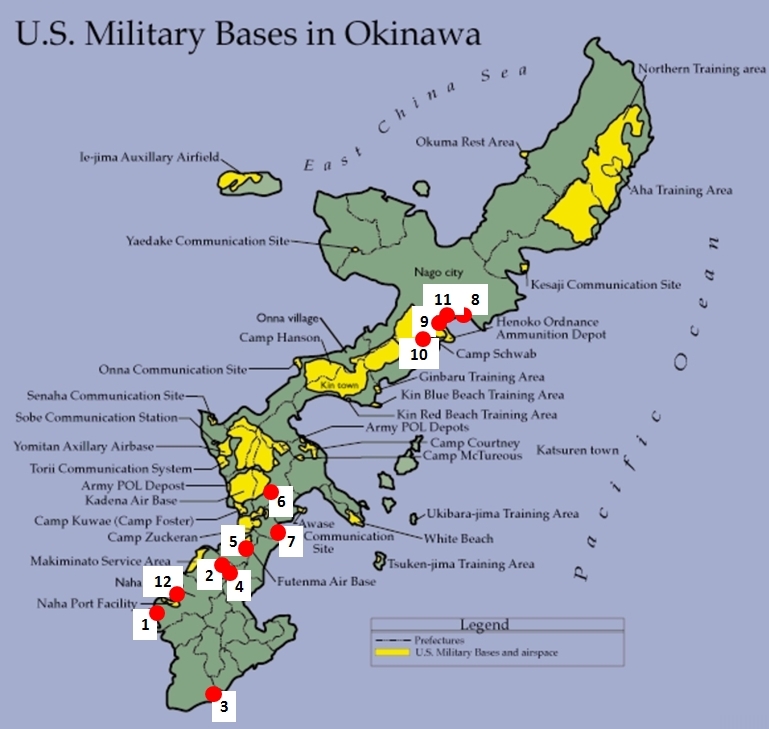 Although the US occupation of Japan ended in 1952, US administration continued on Okinawa until 1972. 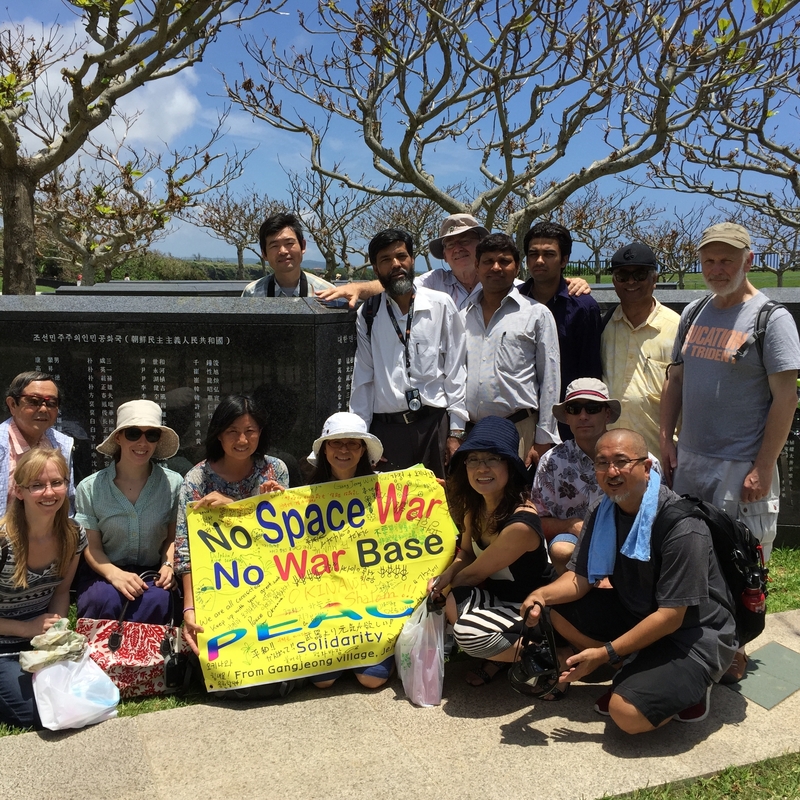 In 1951, when the San Francisco Peace Treaty was officially recognized, Okinawa legally became a possession of the United States. 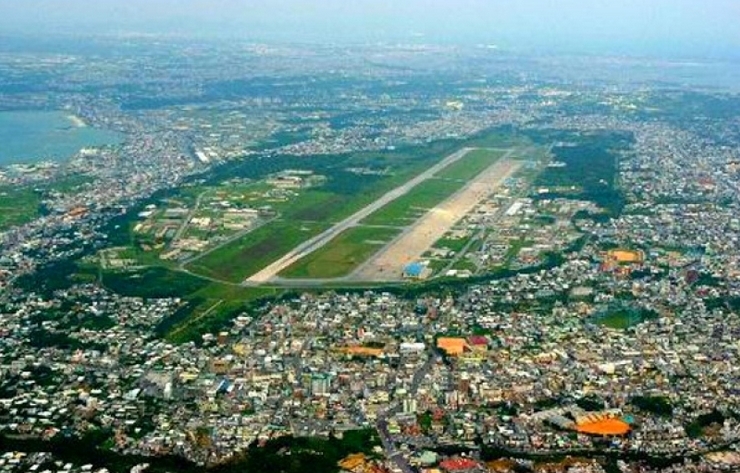 In 1972, control of Okinawa was reverted to Japan. 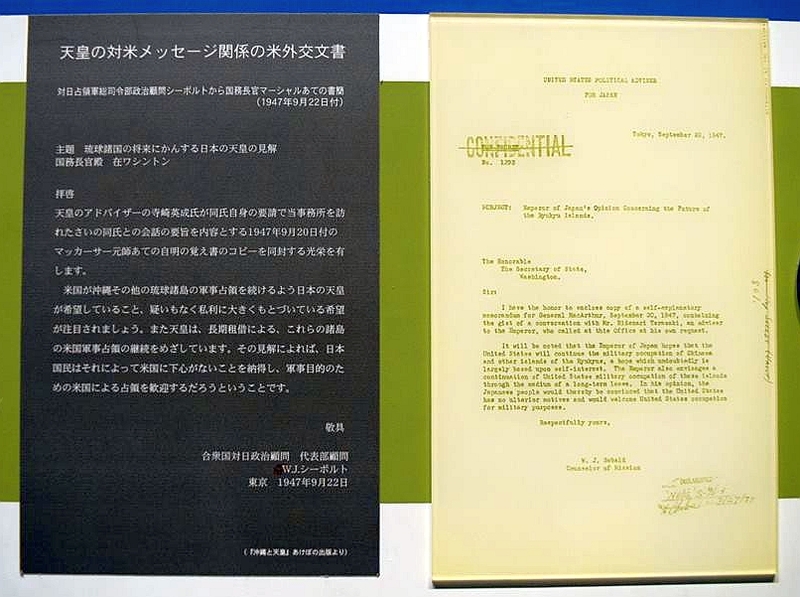 The US-Japan security relationship was defined by a number of documents, including the Treaty of Mutual Cooperation and Security, which committed both countries to meet common dangers, and a Status of Forces Agreement that governed the legal status of US forces and their dependents stationed in Japan. 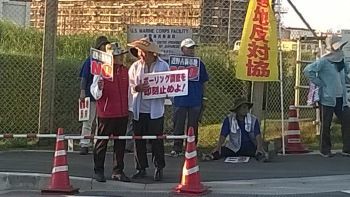 The US forces on Okinawa occupied about 10 percent of the land in the prefecture. 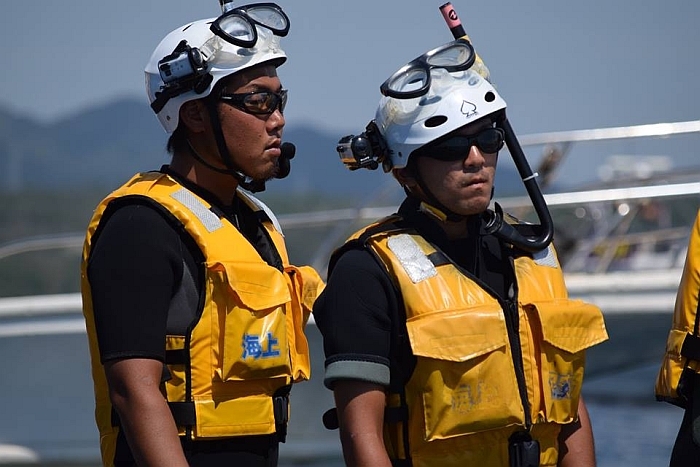 Japan provided part of the cost of the forward deployment of US forces throughout Japan, through an annual burden-sharing payment. This payment was about $4.9 billion in FY97. Kinjo Minoru’s depiction of the horror of the Battle of Okinawa, during which many Okinawans were killed or forced to commit suicide after seeking refuge in the island's caves. 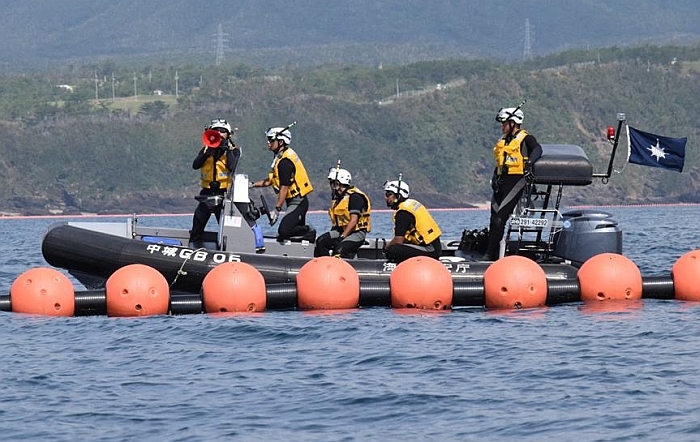 The issue of mass suicides exploded in March 2007 with the announcement that all references to military coercion in the compulsory mass suicides (shudan jiketsu) of Okinawan residents during the Battle of Okinawa were to be eliminated. 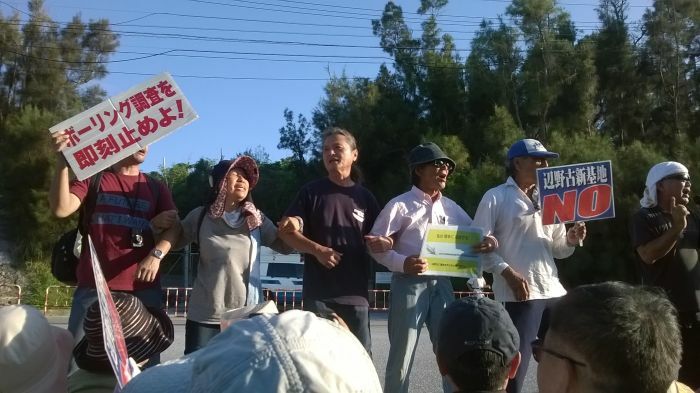 The announcement triggered a wave of anger across Okinawan society leading to the mass demonstration in Ginowan City of 110,000 Okinawans addressed by the top leadership of the Prefecture. 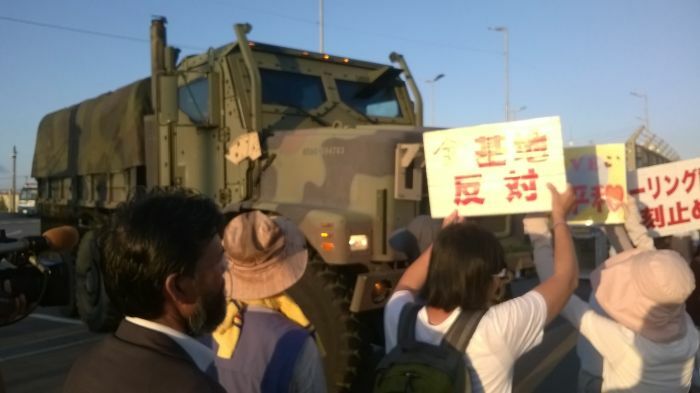 It was the largest demonstration since the 1972 reversion of Okinawa. in textbooks to the coerced mass suicides on their island in 1945. 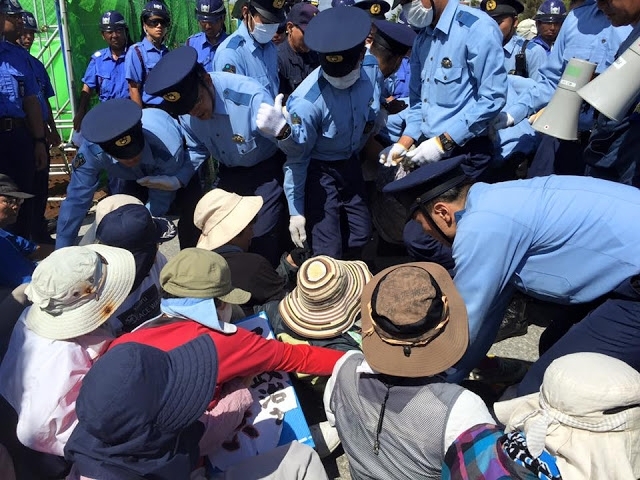 See:Compulsory Mass Suicide, the Battle of Okinawa, and Japan's Textbook Controversy. The professor explains how thie meaning of this poster - displaying an American GI looking at the body of a dead or dying Japanese woman dressed as a soldier. Two hand grenades lie nearby - one to use against the enemy, the other to use as a final act of suicide. 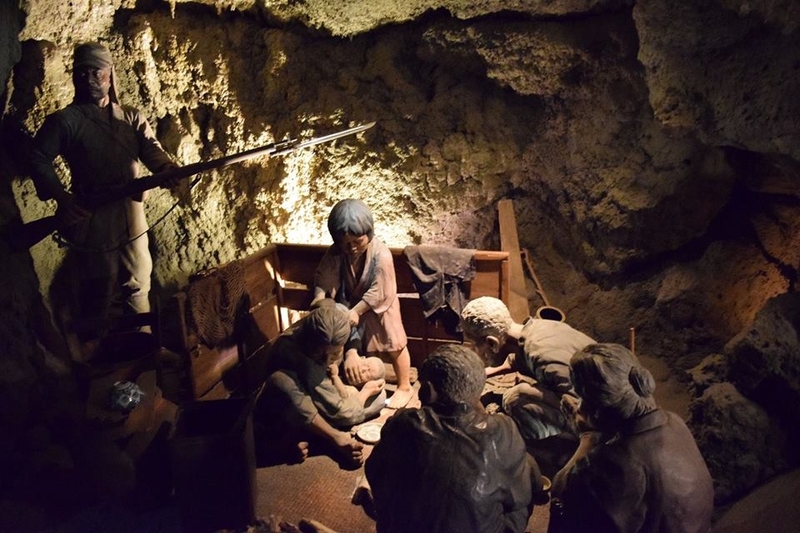 This diorama recreates a scene from the gama (caves) where Okinawans took shelter during the battle of Okinawa. The Japanese soldier stands menacingly over the family while the mother stifles her baby's cries. At one point, a conservative administration tried to soften the image by removing the gun. But there was an outcry and the gun remains. 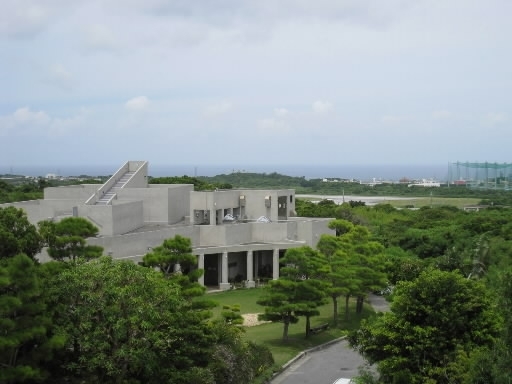 Opened in 1975, built on Mabuni Hill in Itoman City, site of the Japanese headquarters and scene of heavy fighting in late June 1945 at the end of the Battle of Okinawa. The Cornerstone for Peace is a memorial to all those killed in the Battle. As of June 2015, there were 241,281 names but new ones are added each year. 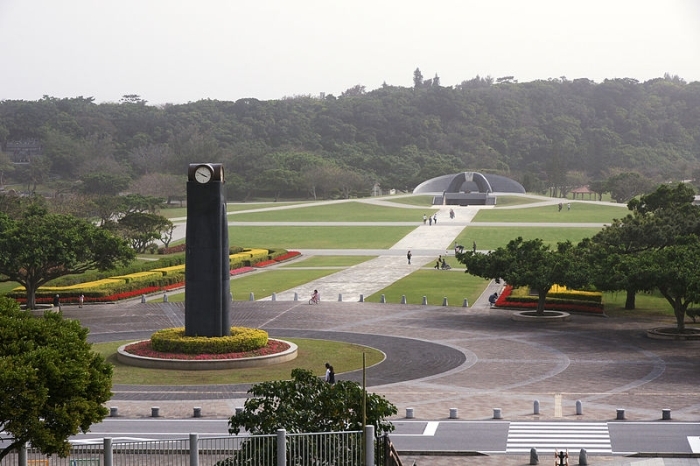 Constructed by the administration of Masahide Ōta, the 'Cornerstone of Peace' alludes to the Japan-US security partnership. 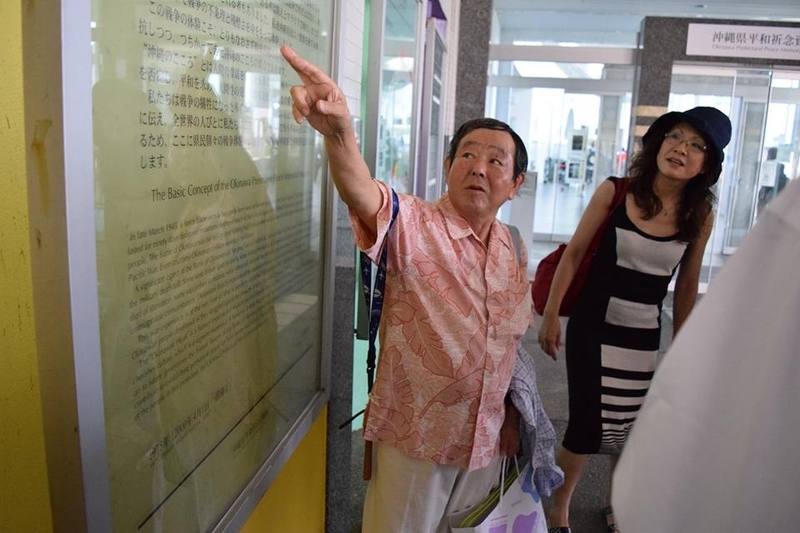 Professor Masaie Ishihara indicates the name of an acquaintance. 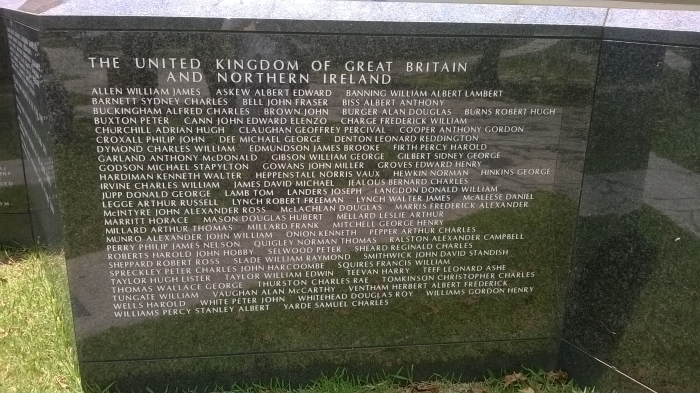 Dave Webb spotted the memorial to 82 from the UK. 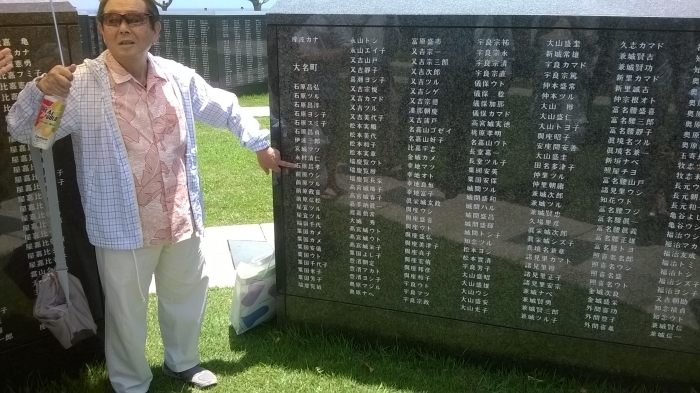 Sung-Hee found the memorial to 447 Koreans (N&S) - seen above with (l to r) Professor Masaie Ishihara, Erin Jones, Sandi Aritza, Sung-Hee Choi, Yasuyuki Sakai, Kazue Okinawa, Kesh Bahadur Pariyar, Jo (Yosi) McIntire, Kyle Kajihiro, Subrata Ghoshroy and Dave Webb. 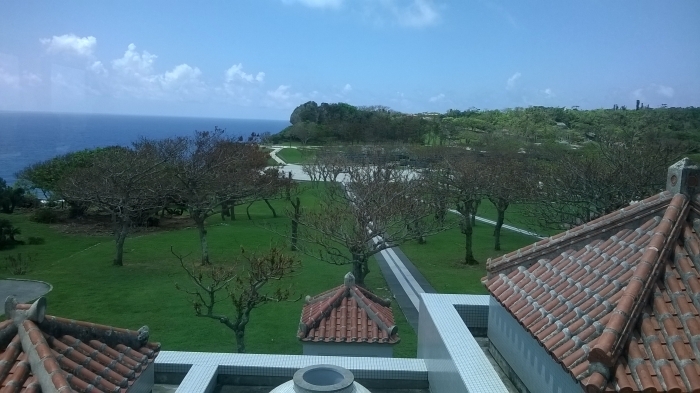 Sakima Art Musuem was established in Ginowan City, Okinawa in 1994 as a "place of reflection." 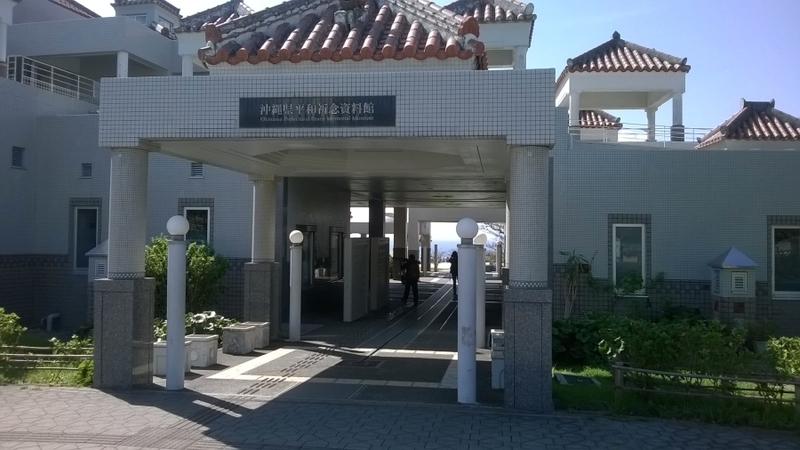 The museum was constructed on a piece of land that was returned from a portion of the U.S. Futenma Air Station. 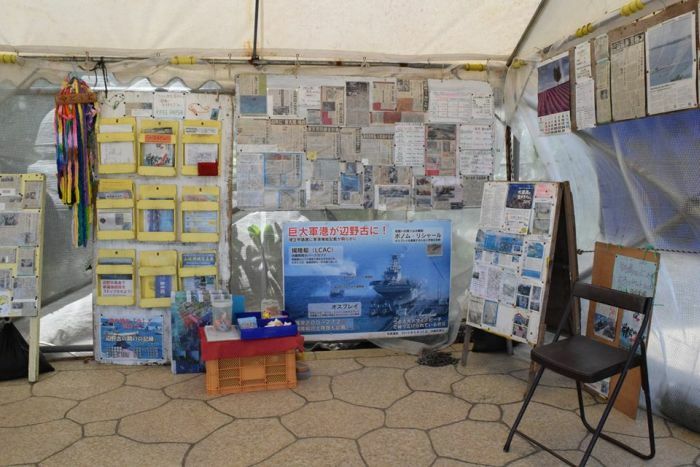 Since then, many people from various parts of Japan, as well as from such neighboring nations as South Korea and China, have visited the museum. The themes of the collection focus on "life and death," "anguish and salvation," and "humanity and war." 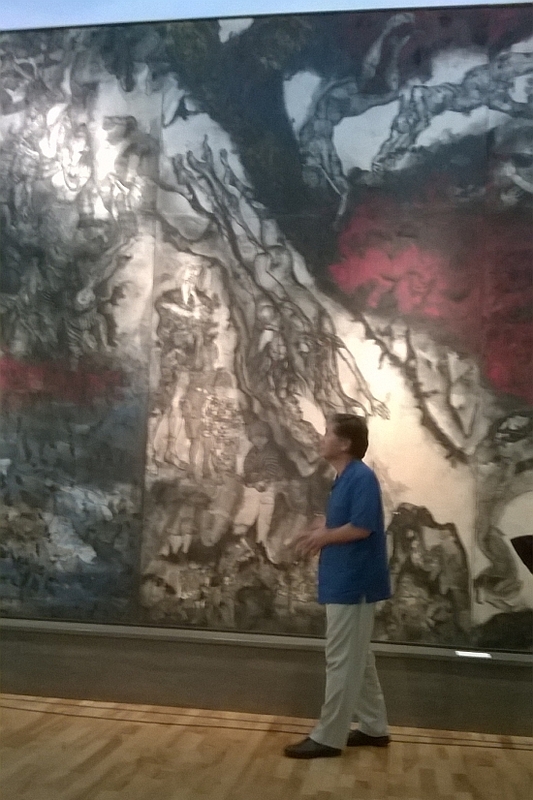 Its permanent collection includes the "Picture of the Battle of Okinawa" (4 meters long and 8.5 meters wide), painted by Iri Maruki and Toshi Maruki, a couple known worldwide for their "Hiroshima Panels." 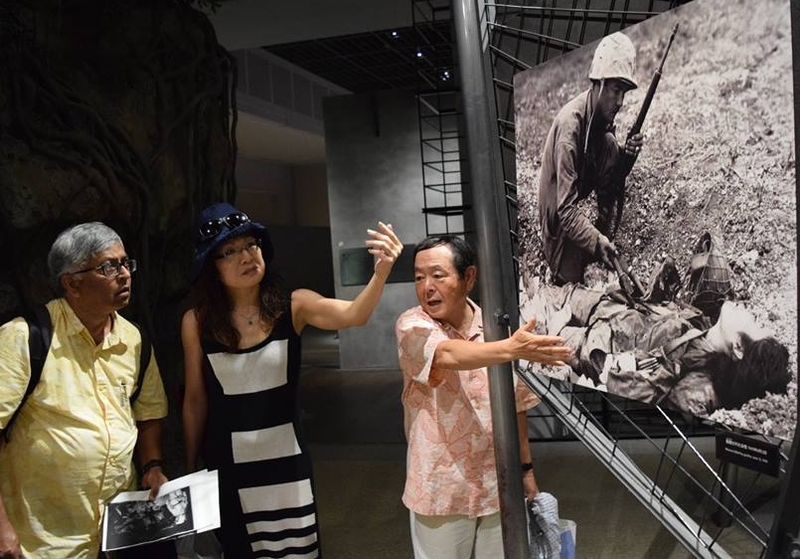 Based on testimonies from the people who experienced the battle, the piece conveys the reality of the battle of Okinawa to serve as a "memory of the common people." 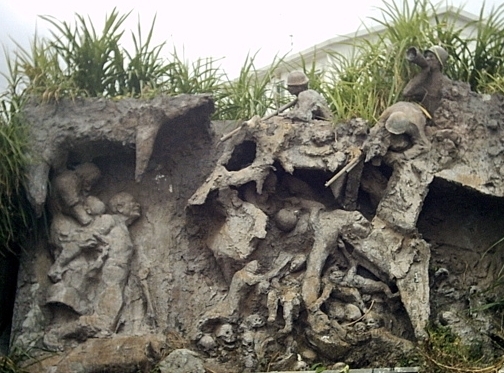 'Picture of the Battle of Okinawa,' created by Iri Maruki and Toshi Maruki. 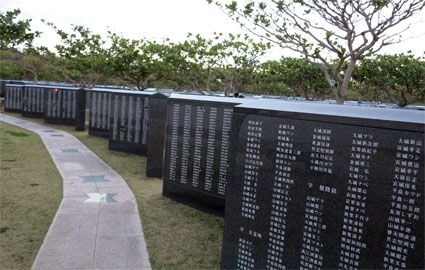 Survivors of the battle of Okinawa, a ground war, are depicted in the panels. 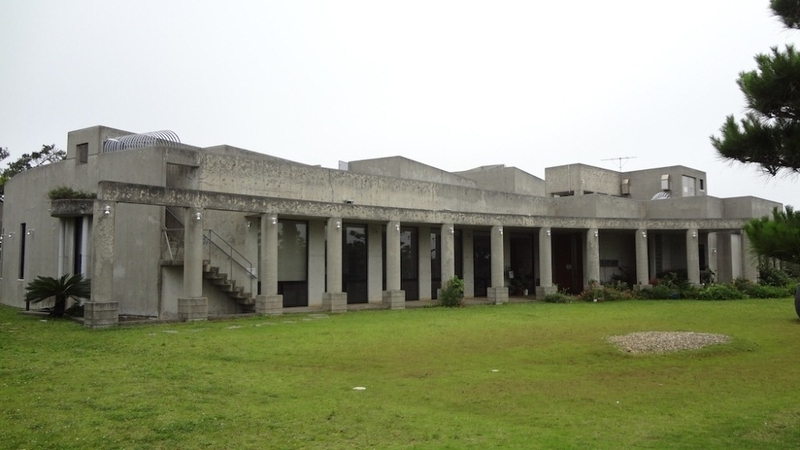 The museum holds about 1,000 works of art, including pieces by Kathe Kollwitz, Georges Rouault, Makoto Ueno, Yayoi Kusama, as well as works by Japan Print Association members and artists of Okinawa. It holds the largest number of pieces by Ms. Kollwitz in Japan. The museum's special exhibitions change about every two months. 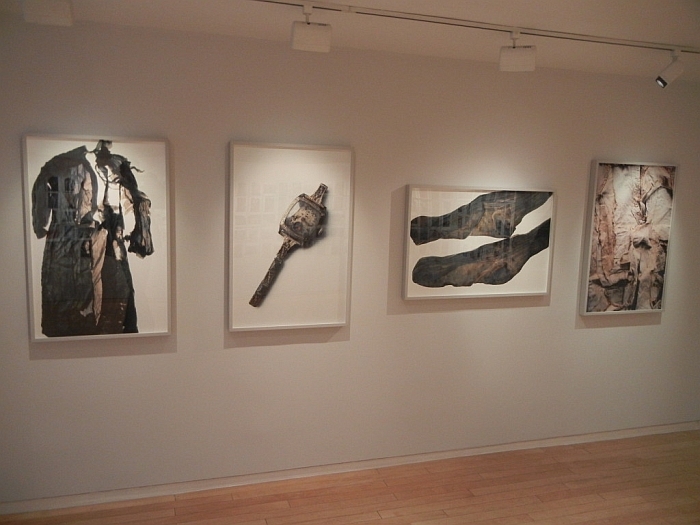 The current special exhibition is "Hiroshima in Okinawa: Miyako Ishiuchi Exhibition," which runs through August 9, 2010. The beauty of her photographs, which feature personal mementos of A-bomb victims that have been preserved at Hiroshima Peace Memorial Museum, have renewed these images of the atomic bombing and generated a strong response from the public. 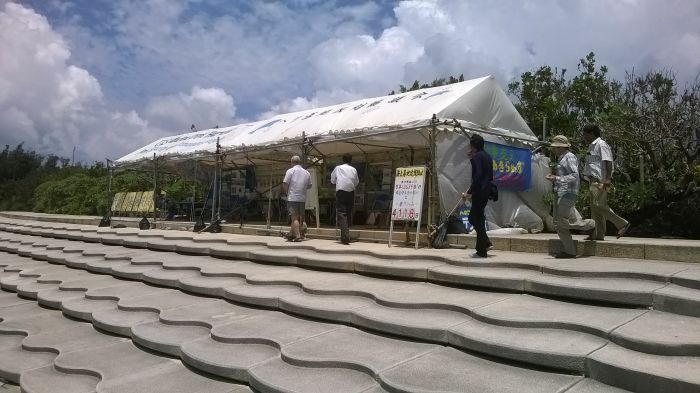 Miyako Ishiuchi's exhibition "Hiroshima in Okinawa" - more information about the exhibition here. 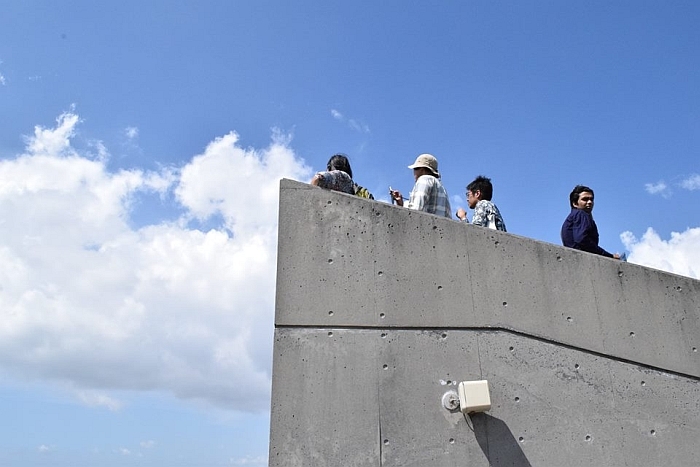 Staff members of the museum offer explanations of the "Picture of the Battle of Okinawa" and the U.S. Futenma Air Station, which is adjacent to the museum, to students on school trips. 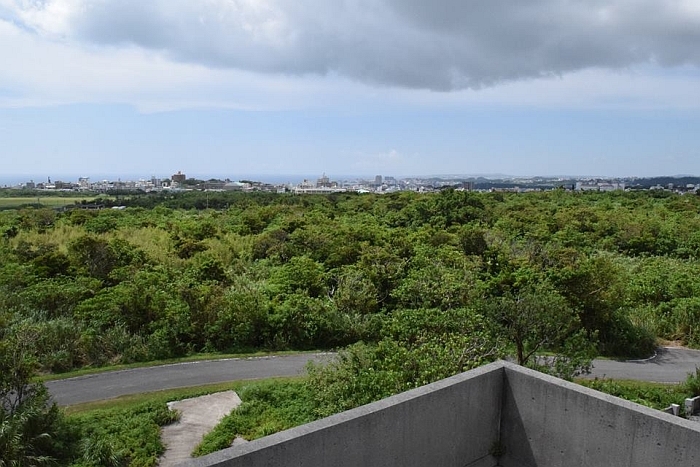 The facility is a significant site for conveying the memories of the Battle of Okinawa and the reality of Okinawa. About 40,000 students visit the museum each year on school trips. 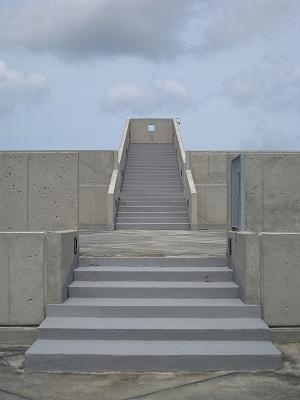 Rooftop steps on the museum building, comprised of six steps and 23 steps. 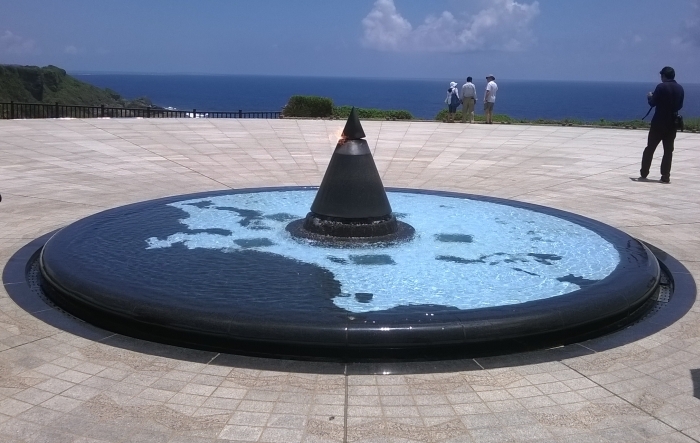 On June 23, the Memorial Day for the Battle of Okinawa, the setting sun aligns with the square window at the top of the steps. With local resident on the roof of a house just across the road from the air field. 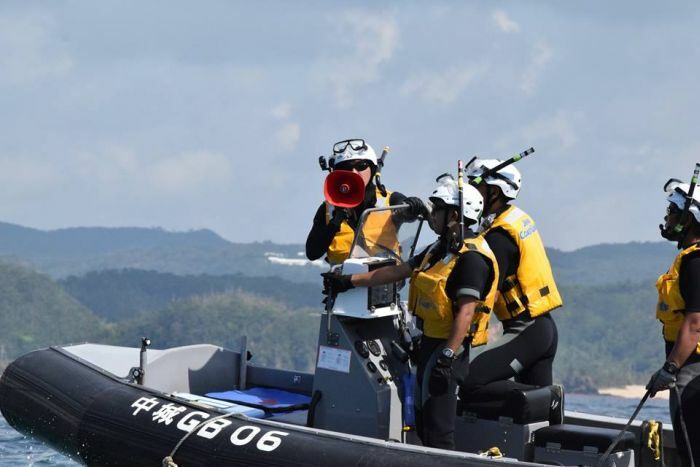 we could hardly hear what was being said because of the noise coming from the base.. The view from the roof - the airplanes are recharging their batteries and to do this they run their jet engines continuously. The noise is extremely loud and goes on 24 hours a day 7 days a week! No wonder these citizens feel agrieved! 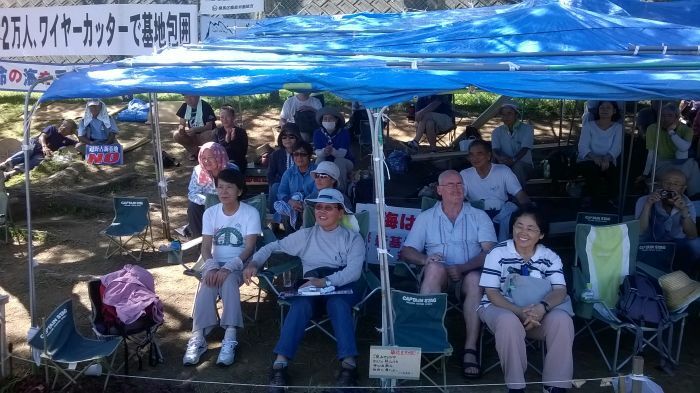 On the evening of the 27th we joined local citizens at the Kitanakagusuku Community Centre. 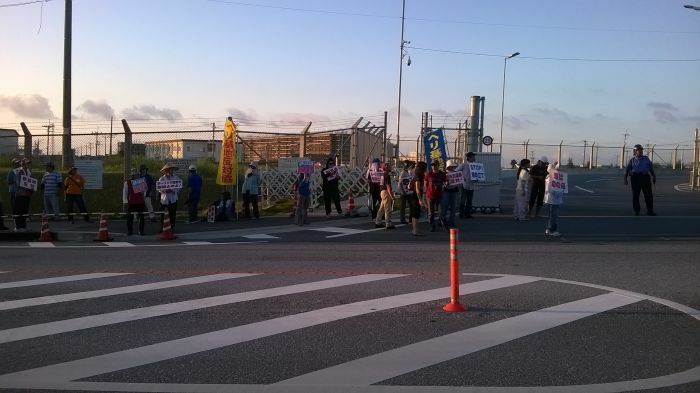 We were asked a number of questions about our impressions of Okinawa, why we had come and what our own protests were about. 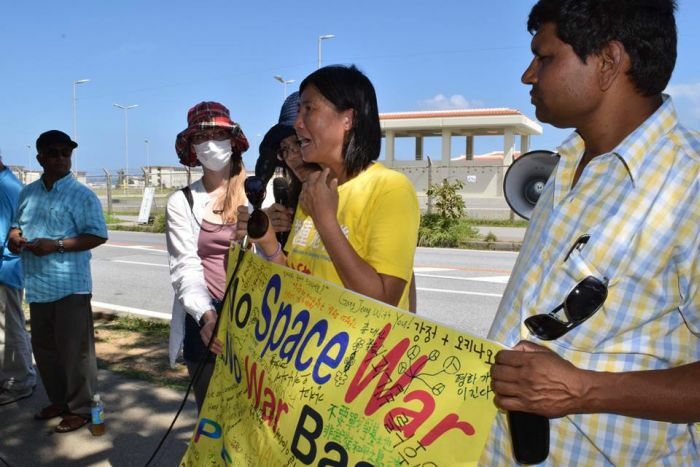 Sung-Hee gave a passionate speech outlining her struggle with the village of Gangjeong on Jeju Island in South Korea. 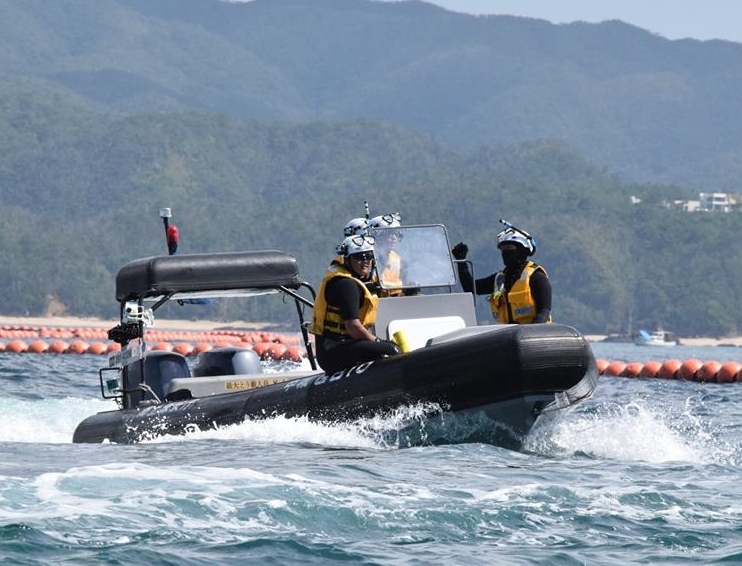 The campaigns of Jeju Island and Okinawa are the same - attempting to prevent military expansion from destroying the environment and the livelihood of the people it says it is protecting. 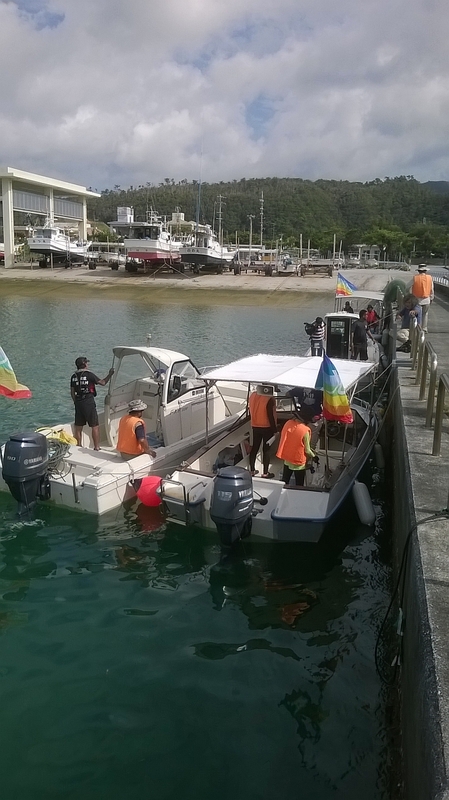 We visited Heneko (Naho), where the U.S. intends to establish a new Marine base adjacent to Fort Schwab. 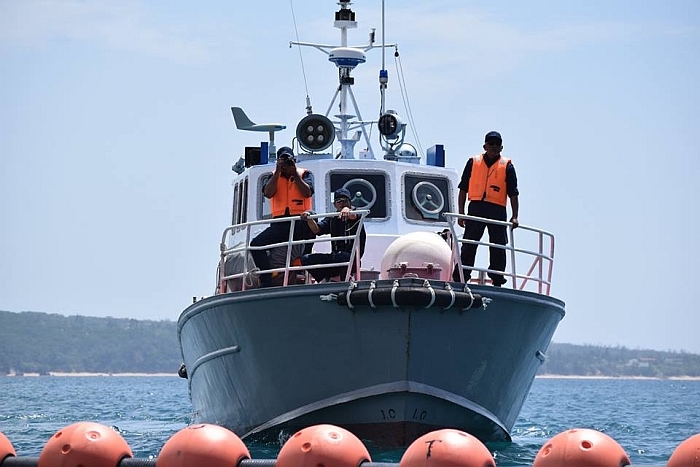 The project calls for reclaiming land for two airstrips and a deep sea mooring dock. 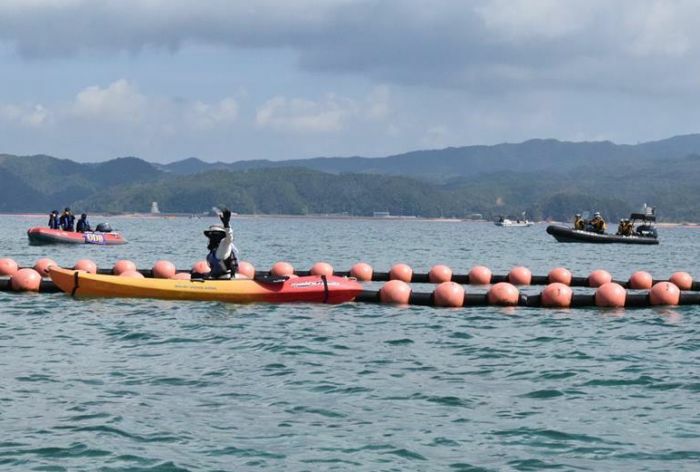 The project will require 21 million cubic feet of fill and concrete at the cost three billion dollars – again at Japanese expense. 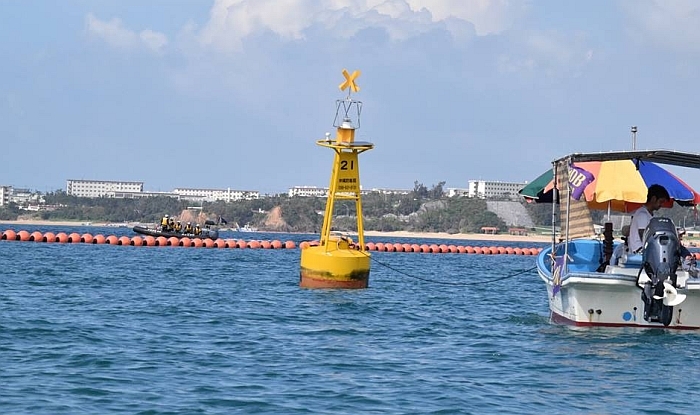 ... the yellow buoys later introduced by the Okinawa Defense Bureau (ODB) to mark out a "no-go region"
... a speedy visit from the coast guard. Warnings and requests to move away! ... close encounters of an absurd kind! 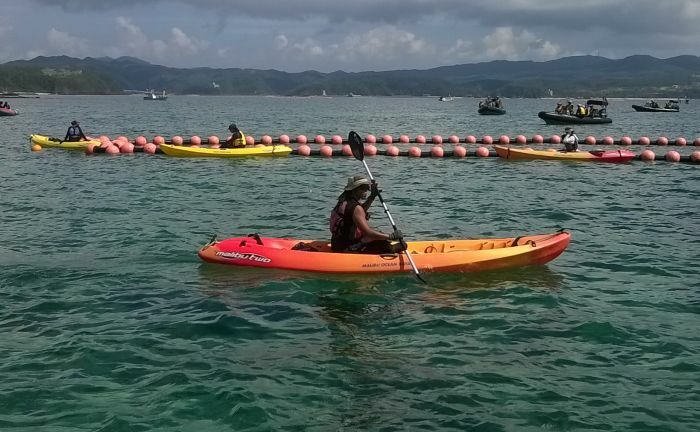 There are a number of wonderful kayakers that constantly patrol the area. ... until the next time! 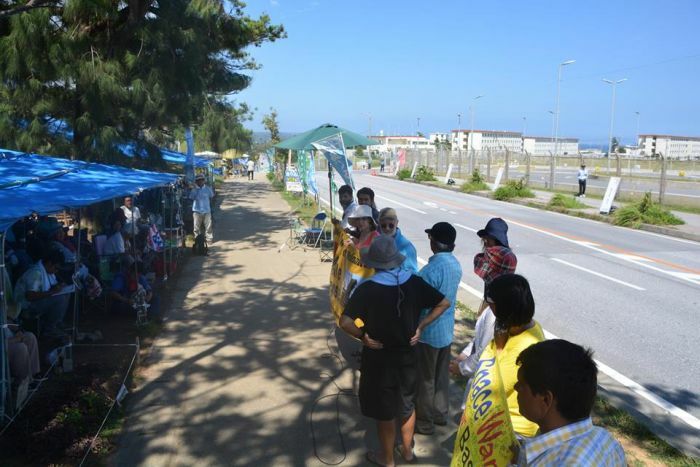 In Okinawa there is broad consensus that the bases must go! 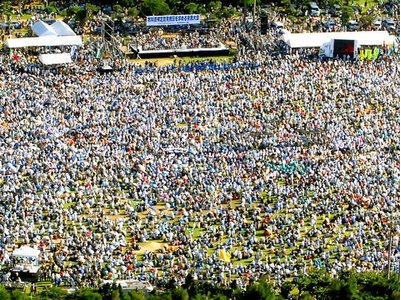 Popular opposition to any modification of the “Peace Constitution” is growing across all of Japan. 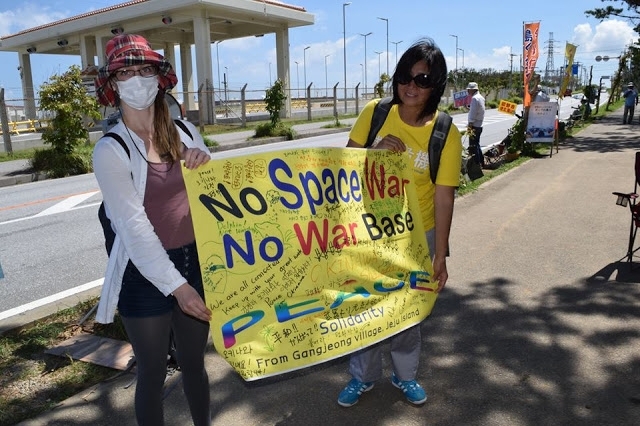 The anti-U.S. bases and the “save our constitution” movements have been fueled not only by the shameful U.S. military engagements since Vietnam, but also has been set back somewhat after the 2011 Fukishima tragedy that ushered Shinto Abe into power. 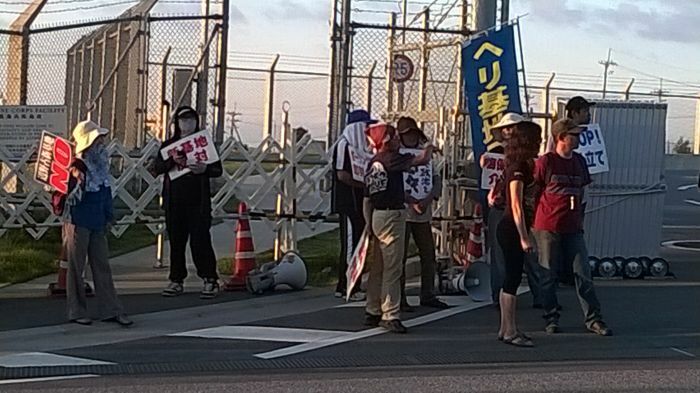 For Abe and the Nippon Kaigi, the U.S. presence represents a national defense umbrella. 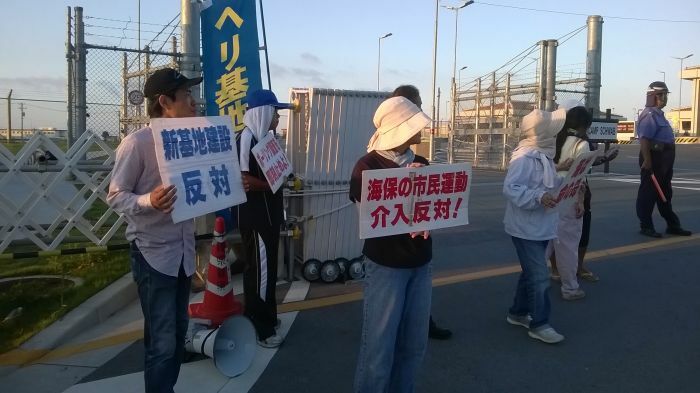 Will the Abe government succeed in overriding the will of the Okinawan people on the basis of national security? 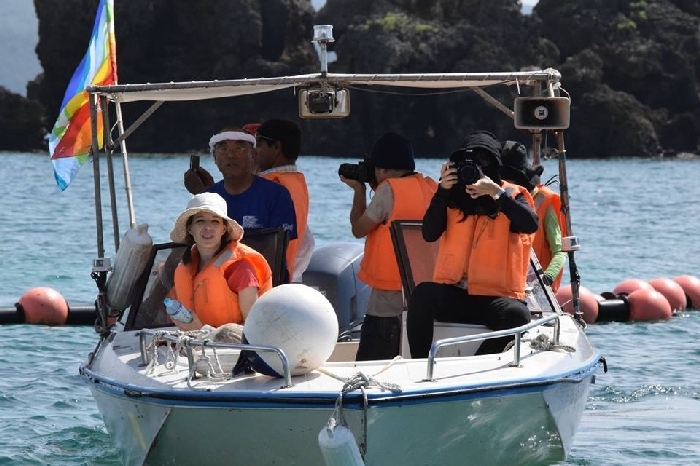 Oscar winner, animation artist, Hayao Miyazaki believes that the demilitarization of Okinawa is the key for peace in East Asia. Democracy in Japan, he says, is in the balance. 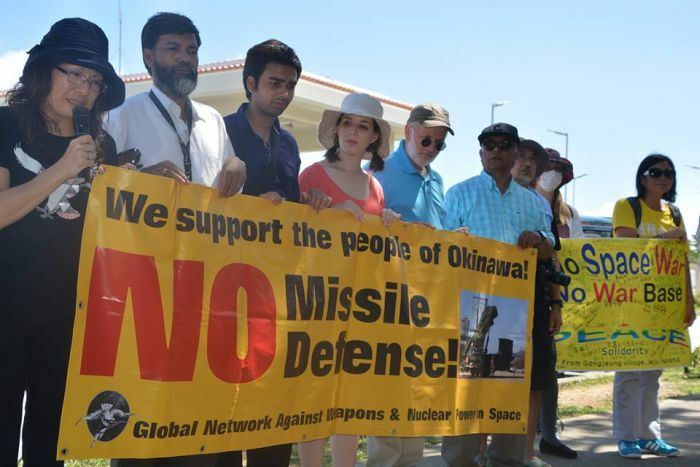 The International Peace Movement is in solidarity with the defiant Okinawan people. 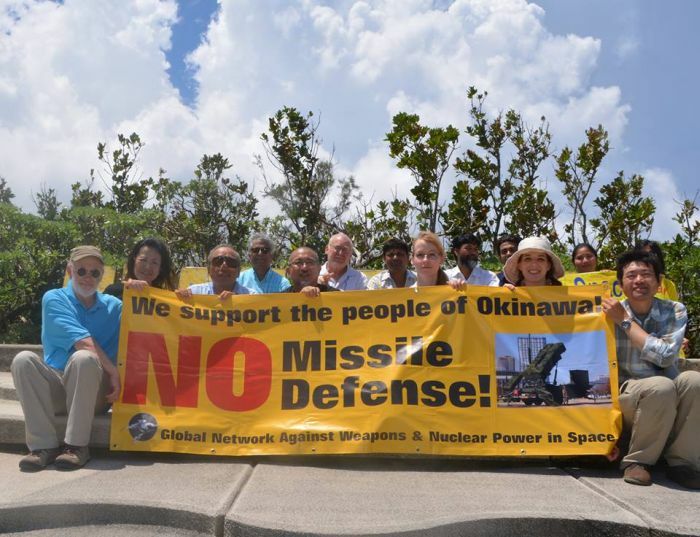 Consensus is that the presence of the bases here, like the other 800-plus U.S. military bases around the world, are industry-driven and don’t serve the interest of the Okinawan people. 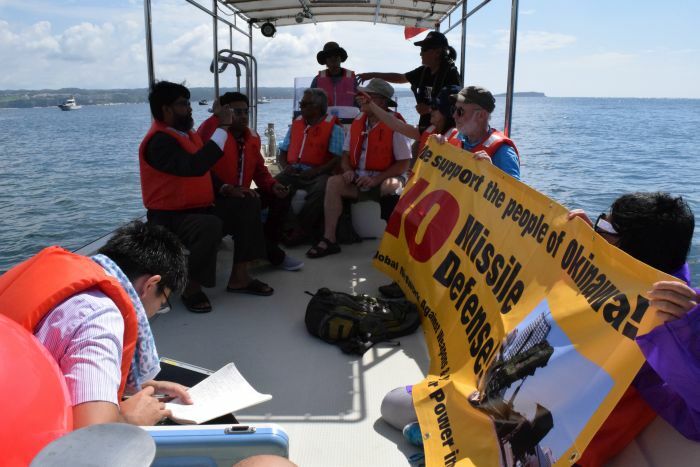 In the context of East-West tension, members of the international peace movement argue that many of the threats are fictitious, invented by the Pentagon. 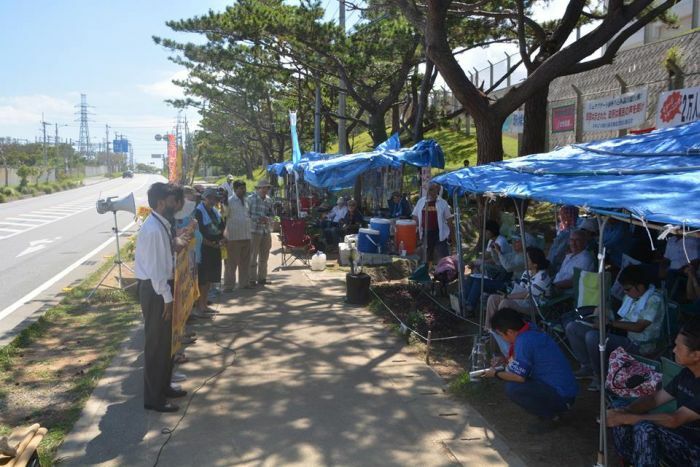 Ficticious or not, the Okinawans want to be “a buffer zone for peace and non-violence” rather than a target of war. 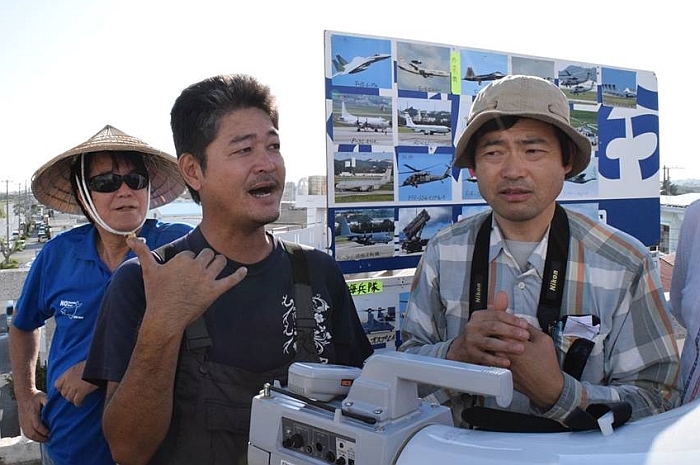 Hiroshi Ashitomi, from the Conference Opposing Heliport Construction (Naho City), who has been demonstrating in front of Fort Schwab for 11 years, argues that the bases are also hazardous for the biodiversity of the area. "Thousands of nuclear weapons in the world wait to be fired at a moments notice. Missile and missile defense technologies are dramatically shortening the time for decisions to be made in a time of crisis. The US says it is developing missile defense systems only to protect itself or its allies against missile attack. 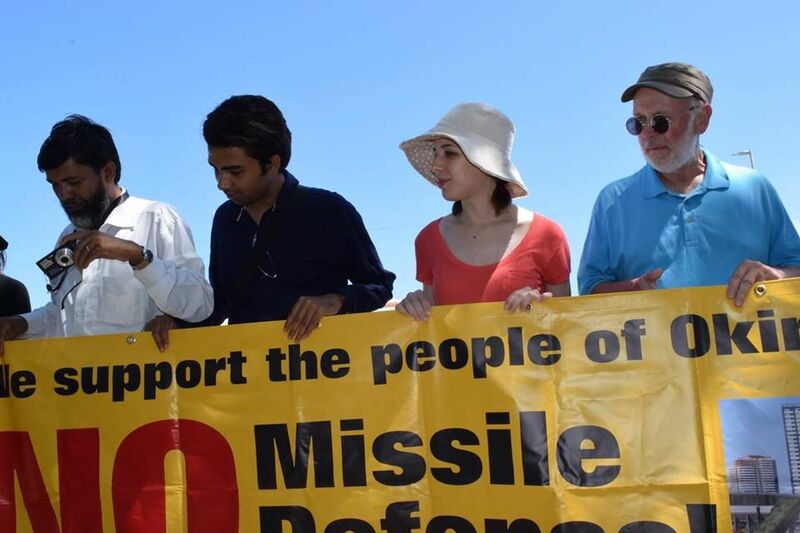 However, justifying missile deployment by just calling it a ‘defense’ system ignores the way it may be used for other purposes and is perceived by other states - and how provocative it actually is. As the number of systems grows, so does the reliance on military threat rather than diplomacy and so are the chances of error and accident."" 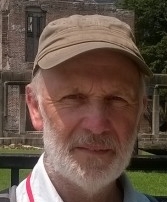 Real security can and must be achieved not by threats, a build up of military might and the erecting of barriers - but through increased efforts with confidence building, genuine attempts to understand the causes of international disputes and the use of restraint, discussion and diplomacy to eventually reach agreement. In some cases the weaponry is as` fictitious as the supposed threat. 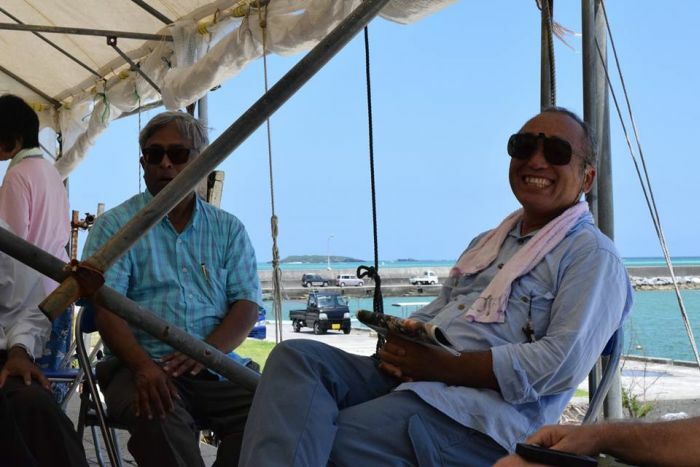 My room-mate on the Okinawa Study Tour, whistle-blower Subrata Ghoshroy, summed up missile defense bleakly: it doesn’t even work. 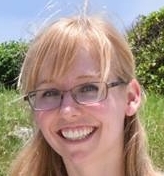 Subrata's credentials: first an engineer working on laser weaponry, later a science advisor to the Armed Services Committee, more recently an MIT researcher in defense and global security issues. 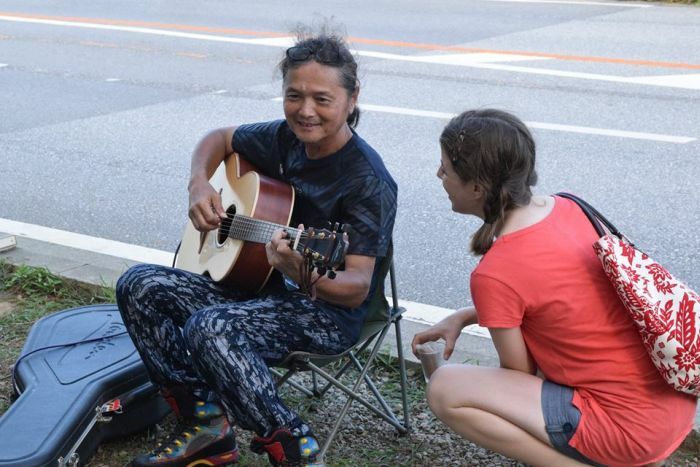 For 10 years, Hiroshi Ashitomi has been coming here every day to sit and join the protest. 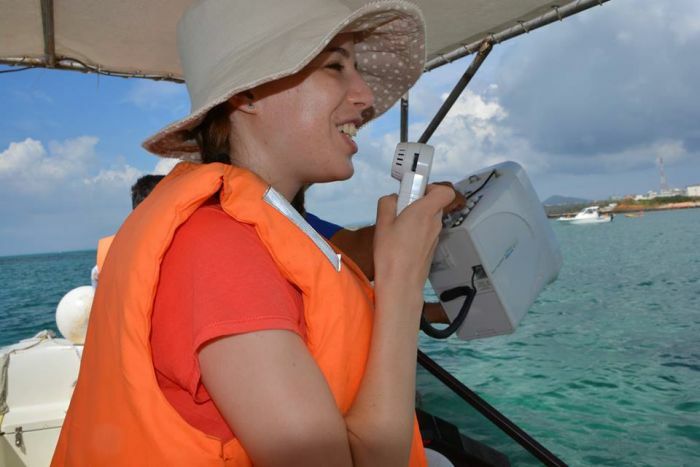 The construction would dramatically change the sea, home to rare dugongs and sea-turtles. 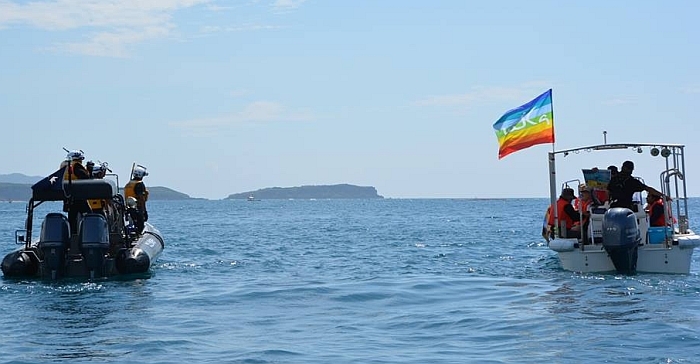 “We can’t let this beautiful sea that we have inherited from our ancestors . . . die. 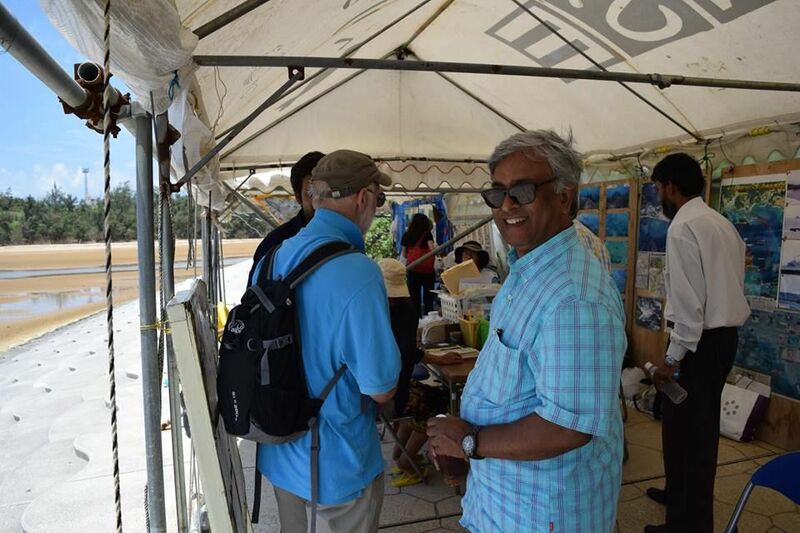 We want our island to be a beacon of peace” he says. 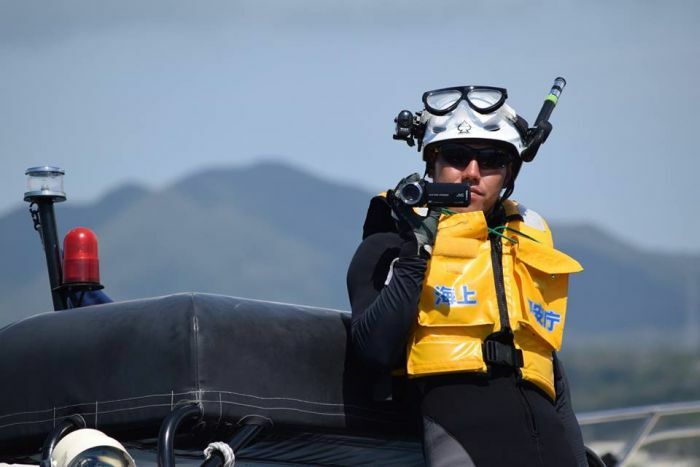 He believes the sea is the greatest gift of his ancestors and he wants to pass it on to future generations. Later, we are joined by another long time protestor. 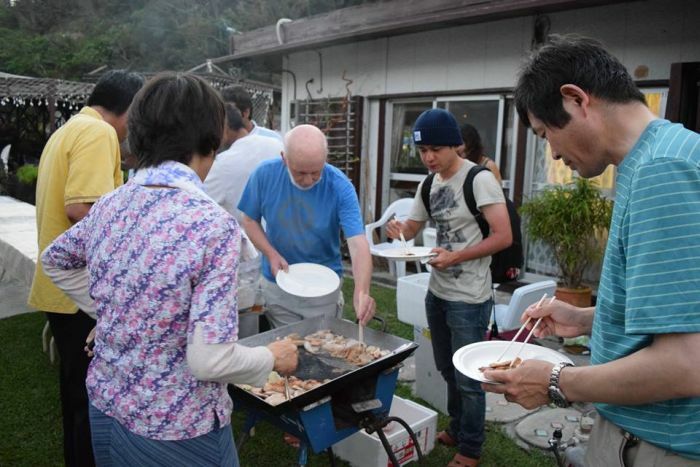 Great bbq at Teruya - with three of us giving a hand by making the bread! And we kept going into the night! We arrived earlier than most! But not earlier than all! 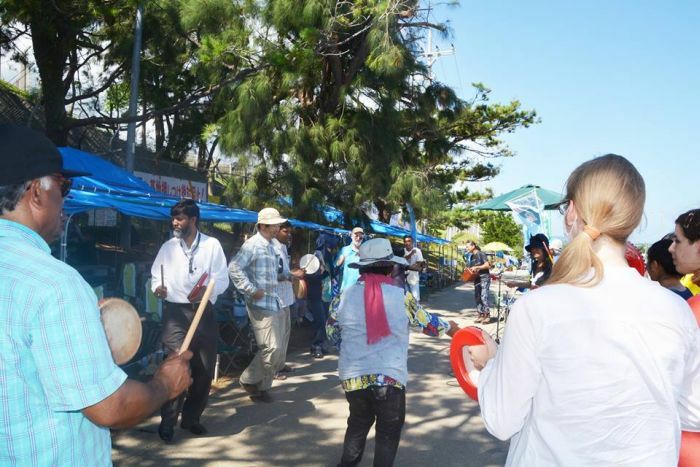 Keeping us entertained while at the sit-down blockade at the main gate. 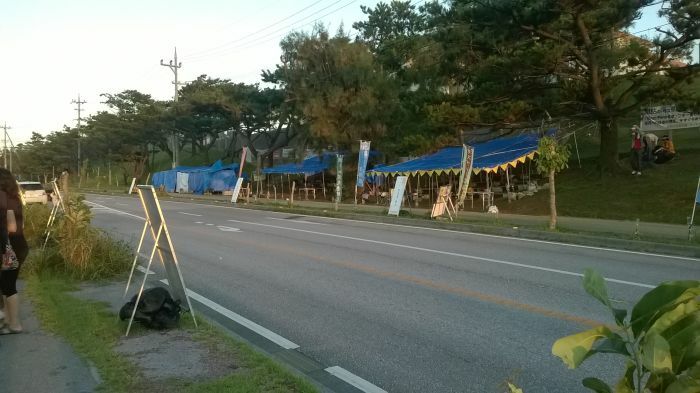 We waited but no vehicles arrived at the main gate while we were there - even some time after the usual time of arrival at 7am. Unfortunately, we had to leave at 7.30 to catch our bus. After we (the international group) had left the police moved in to remove the protesters. 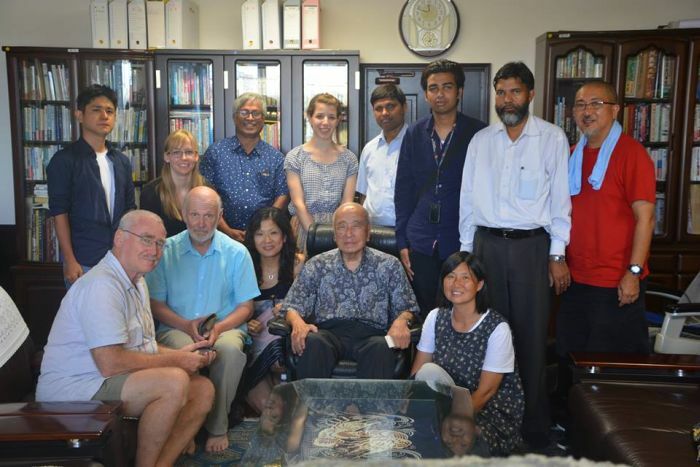 We were lucky enough to spend a half hour or so with the 90-year-old former Governor of Okinawa, Masahide Ota. 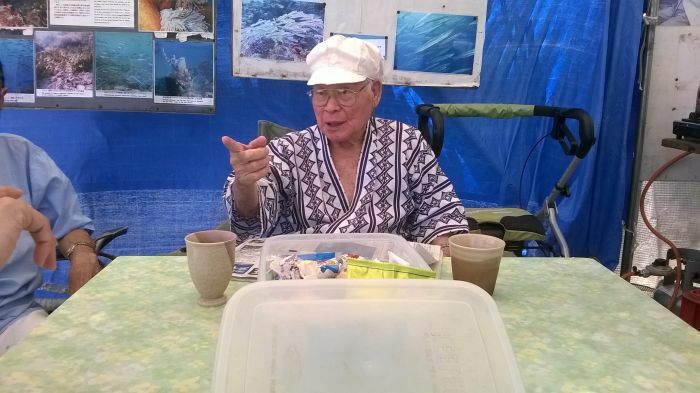 As a high school student, he was drafted into the Japanese Imperial Army as a member of the Blood and Iron Student Corps which was organized just before the US invasion in 1945. He survived the three-month battle that was later called the bloodiest in the Pacific War. 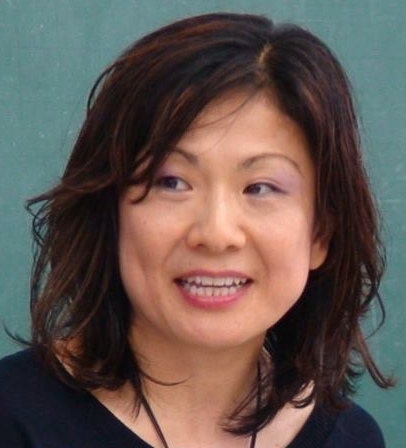 Ota was educated at Waseda University, Tokyo, and Syracuse University, New York and was Professor of Social Science, and Dean of the Faculty of Law and Letters in the University of the Ryūkyūs, specialising in modern and contemporary Okinawan society. 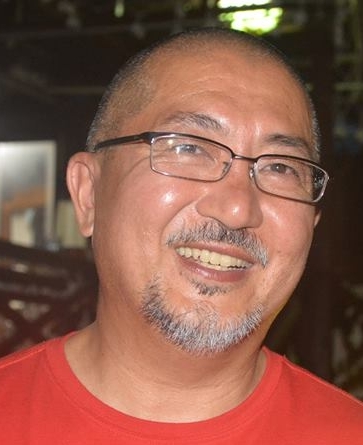 He has written many books on Okinawa, of which the best known is his account of the Battle of Okinawa as he saw it as a high school student at the time. 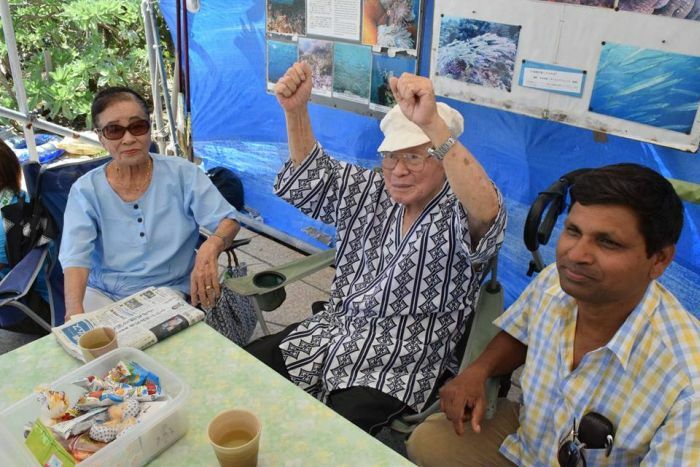 In November 1990, after retiring from the university in March, Ota was elected governor of Okinawa prefecture on a non-party platform but with broadly leftist support. 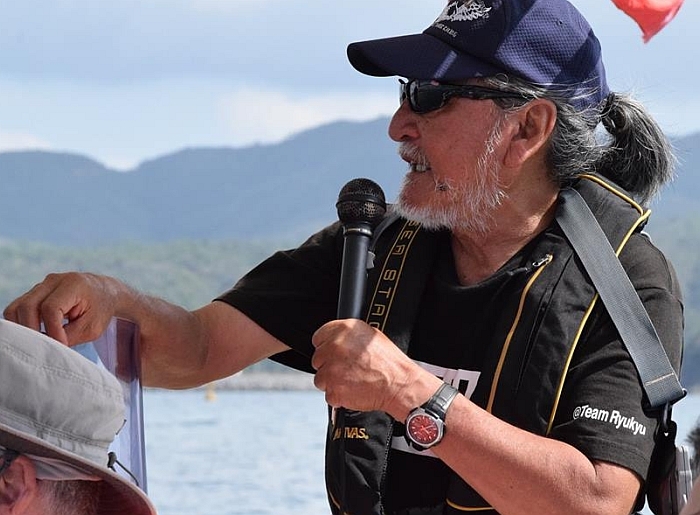 He had a distinguished record as a governor, outspokenly arguing for the interests of the Okinawan people against both the United States military establishment in the Ryukyu Islands and the Japanese central government. He spoke eloquently to us about how he sees the US military bases as a war relic that should be abandoned once and for all. 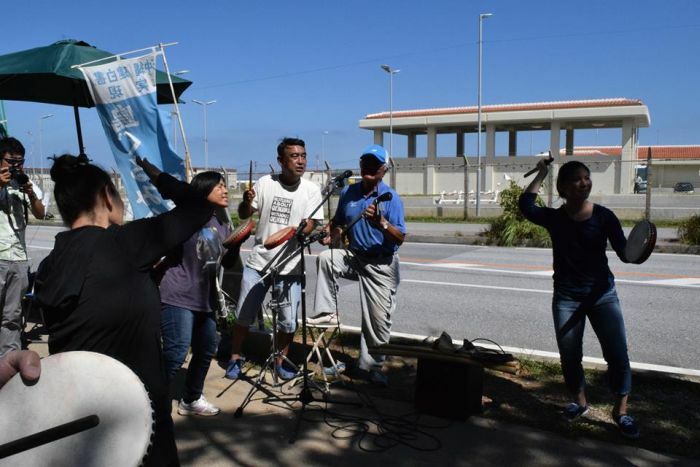 "People opposing military base construction in South Korea, working for demilitarization in the mainland United States and in Hawaii--ten researchers, students and activists fighting for peace spent three days in Okinawa. 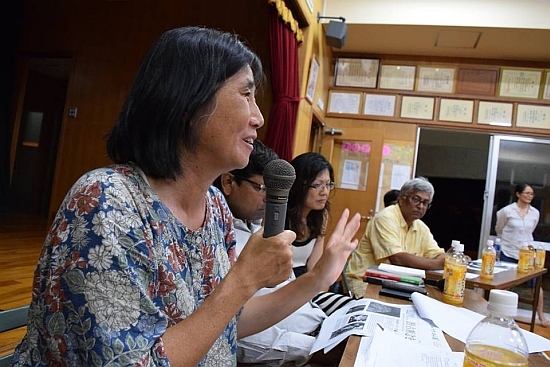 An activist from Nepal involved in human rights issues of people from a caste suffering discrimination said, "My work focuses on human rights, education, and peace." Indeed, it is impossible to separate the issues of human rights, education, and peace. All are necessary for humans to live a dignified life. 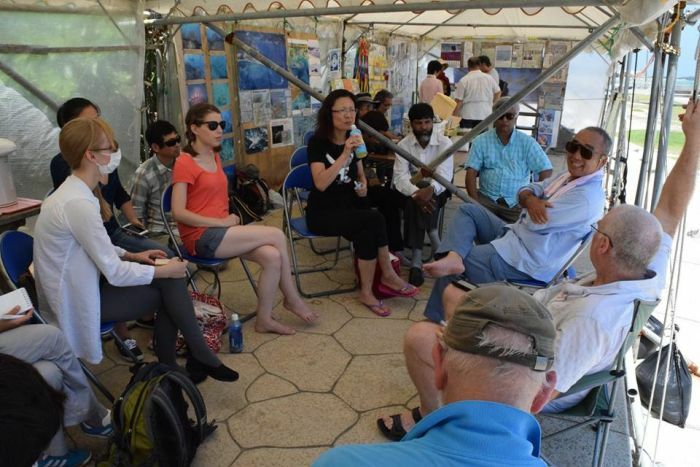 The visitors learned about the Battle of Okinawa 70 years ago as well as the current base issues, the new base that is planned to be built in Henoko, Nago, and the people protesting against it. 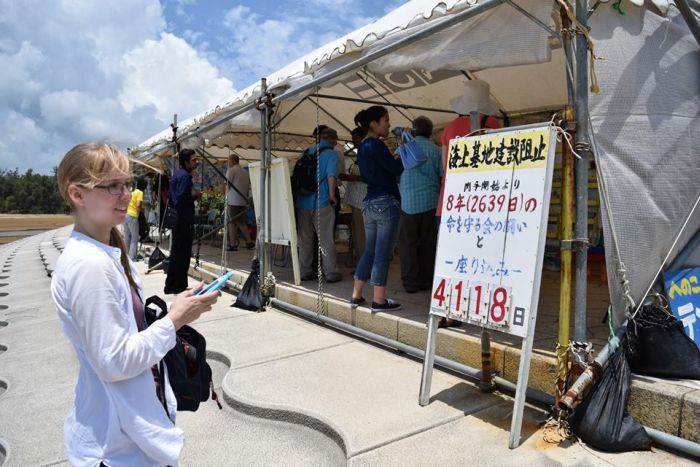 Even these visitors, who have faced many difficult issues, were surprised at Okinawa's current situation in which people suffer the oppressive presence of the US bases and live under the explosive noise of military aircraft, which they described as an "unimaginable living environment." 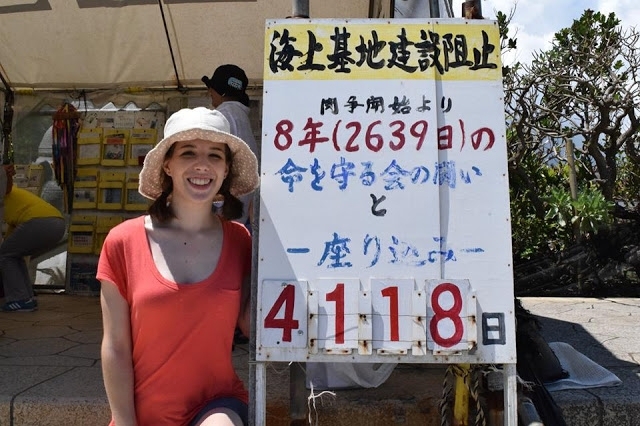 Kazue Nakamura-Huber, who supported the visitors during their stay, said, "I get so used to it that I tend to forget sometimes, but the unnaturalness of the bases being here was driven home to me once again." 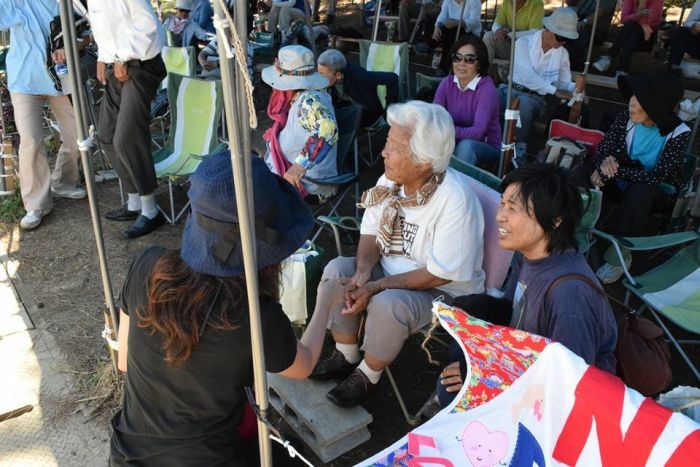 At a gathering in Ogusuku, Kitanakagusuku, an Okinawan person said, "we can't solve the base problem just by ourselves in Okinawa." 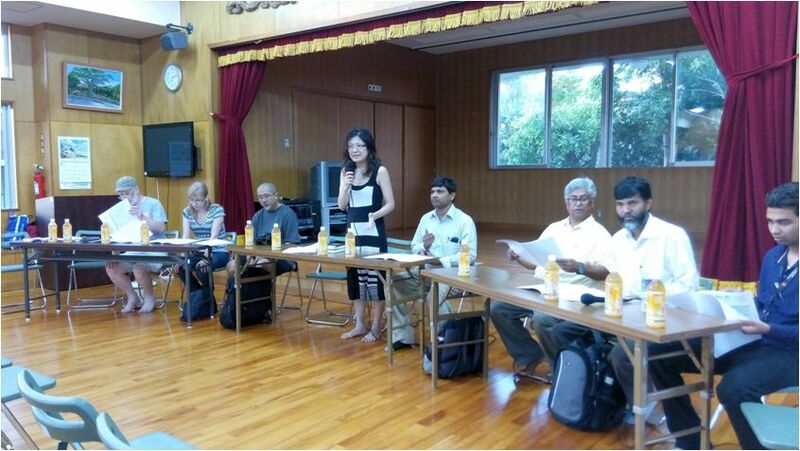 In response, the visitors gave opinions, such as, "It is a problem of democracy worldwide. We must solve the problems by gathering together in solidarity." I truly felt that there are people in the world resisting oppression and fighting for peace. I felt more strongly than ever that even if we are far apart geographically, we can get strength from each other through mutual understanding and engaging in dialogue from a broad perspective.